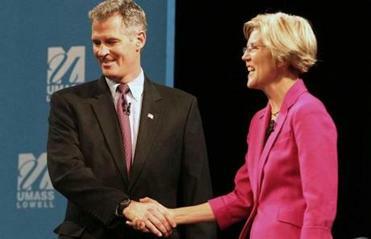 Senator Scott Brown, in a fast-moving, highly combative debate Monday night, vigorously attacked Elizabeth ­Warren’s legal work on behalf of corporations, while she blasted votes he took in lock step with the Republican leadership. The hourlong debate, the second of four, skipped quickly from issue to issue, bouncing from immigration to Afghanistan to whether Bobby ­Valentine should be ousted as the Red Sox manager. At times, policy took a back seat to sniping over some political flash points that have animated the nation’s most expensive, most fiercely fought Senate race. While no one appeared to score a knockout blow that would instantly change the shape of the race, both will probably pounce on moments they believe could give them an edge. Brown, asked to name the Supreme Court justice he considers a model, hesitated and then cited Antonin Scalia, a conservative firebrand known for his outspoken criticism of gay rights, abortion, and liberal social causes. Facing some boos in the ­audience of 5,700 at the ­University of Massachusetts Lowell, Brown quickly added three more justices across the ideological spectrum: Anthony Kennedy, a frequent swing vote; Chief Justice John ­Roberts, a conservative who voted to uphold President Obama’s health care law; and Sonia Sotomayor, a liberal. Pressed by the moderator, David Gregory of NBC’s “Meet The Press,” to name a Republican senator with whom she could work, Warren mentioned Richard Lugar of Indiana, who was defeated and will not be in the Senate next year. Reminded of this fact, ­Warren did not name another Republican senator with whom she could collaborate, but said she worked with Republicans on a panel that oversaw the federal bank bailout and could work with Republicans to overhaul Fannie Mae and Freddie Mac, the troubled mortgage ­giants. Both candidates were aggres­sive, attacking each other throughout, while often complaining that they were ­being misrepresented by their opponent and not being given time to correct the record. “Excuse me, I’m not a student in your classroom. Let me respond,” Brown chided ­Warren during one heated ­exchange. Brown, who has gone to lengths to distance himself from national Republicans, ­insisted that he was undecided on whether to support Mitch McConnell, the minority leader, to lead his party in the ­Senate next year. Brown also repeatedly sidestepped questions about his support for presidential candidate Mitt Romney, who is polling at just 30 percent in Massachusetts, the state he once led as governor, according to a ­Boston Globe poll Sunday. In an exchange that allowed him to take the offensive, Brown slammed Warren for representing two giant corporations, saying the work flies in the face of her reputation for standing on the side of consumers and working people. He seized on Warren’s work for Travelers Insurance in an asbestos lawsuit. At the time, the company was seeking to unlock a $500 million settlement account for victims in ­exchange for receiving immunity from future lawsuits, a step many asbestos victims supported. After Warren left the case, however, Travelers won a separate court ruling that allowed the company to avoid paying out the settlement. That ruling is under appeal. Warren pointed out that ­asbestos workers unions and plaintiffs’ attorneys have said her involvement in the case was intended to preserve payments for victims, not undercut them. Brown also blasted Warren for helping to write a petition to the Supreme Court for LTV Steel in the 1990s, assisting the former industrial conglomerate in its fight against a congressional requirement that it pay millions of dollars into a fund for retired coal miners’ health care. “When no one was watching and when she had a choice to make, when the cameras weren’t rolling, she chose to side with the steel conglomerate,” Brown said. When the debate turned to policy, Warren said she wants to accelerate the withdrawal of troops from Afghanistan while Brown, a longtime member of the National Guard, said he supports Obama’s plan for withdrawal in 2014. Warren criticized Brown’s votes against Obama’s jobs bills, against closing tax subsidies for oil companies, and against the so-called Buffett Rule to raise taxes on the wealthy. The votes, she said, show Brown is not the bipartisan moderate he claims to be. Brown argued that oil companies will pass the cost of higher taxes on to drivers and homeowners and said that the Buffett Rule “makes a great sound bite, but it funds the government for a day.” He said that, in general, Warren’s drive to raise taxes will hurt business in a slow economy. On a less weighty subject, Brown dodged on whether to fire Valentine after the deplorable Red Sox season, while Warren said she would keep him another year. The controversy over ­Warren’s heritage fueled one of the most personal exchanges of the night. Brown argued that Warren “misled the voters” by not acknowledging more quickly that she told Harvard Law School, after she was hired, that she has Native American heritage. “I do question the fact that she misled the voters for over five weeks by saying she had no idea how Harvard came to know she was a Native American and she, in fact, was the person who self-reported,” Brown said. Warren reiterated that she believes she is part Native American, based on family lore, and that she never sought or ­received any professional advan­tage because of that claim. Minutes before the debate, Warren made a surprise disclosure intended to defuse a line of attack that Brown was ­expected to deploy. She released a list of 13 legal cases she has worked on, bowing to a request from Brown, and called on him to do the same. Warren did not indicate whether the list represented a complete accounting of the ­clients she has represented. Brown had been criticizing Warren for refusing to disclose her clients, and the move seemed designed to allow her to turn the tables on him. When the subject came up in the debate, Brown insisted he already has released a list of his legal clients. In fact, he disclosed some of his clients in a recent press conference, but has not produced a complete list.